The musculoskeletal demands in a work environment can be many and varied – from the prolonged standing as a nurse in a theatre environment, to the prolonged sitting and vibration exposure of an excavator driver. For many in an office environment, we spend long hours in front of a computer. Frequently this can result in cumulative musculoskeletal problems affecting neck, shoulders, elbows, wrists, and low back. Workers are so busy doing the job they may not realise the poor postural habits they have adopted. At Coastal Rehab, therapists are skilled in identifying the problem areas contributing to poor postural habits. Looking down to the screen, reaching to the keyboard and mouse, and perching on the chair are issues frequently seen in office environments. 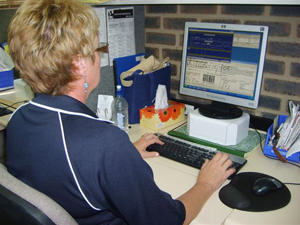 An ergonomic assessment allows for these problems to be accurately identified with immediate changes made to the environment. Equipment recommendations are made to trial products from local suppliers. Education and support is given to each client to help develop better work habits and postural awareness. In this way optimal health can be maintained and injury related problems and workplace absenteeism minimised.